Music boxes, those exceptional objects, evoke purity and angelic sounds of timeless harmonies. We have all, at some time in our lives, listened to a music box but once an amateur discovers large boxes (cartels) his musical horizons expand beyond his wildest dreams. The ingenuity of the craftsmen of the 19th century transport us to a musical world made up of ‘cartels’, snuff boxes, disc boxes, bells, Zithers, celestial voices, etc. This enchanted world is available to all thanks to specialist dealers such as myself. The music boxes and instruments that are offered are the fruits of a never-ending search throughout the world. They have been selected for their aesthetic and musical qualities. 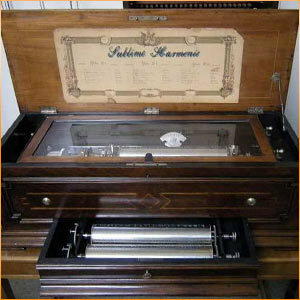 The desire to purchase a music box should be accompanied by an in depth examination of the item. A Music Box Must Play Music! A good, functioning mechanism must be in tune. The box, too, must be in good condition. Joy comes from the combined visual and audible pleasures. Repairs should only be performed by a specialist. Home repairs (DIY) are often disastrous and irreversible.